College Radio Tuner brings a growing network of live, next generation student-run radio stations to a worldwide mobile audience. Listeners get to hear the cutting edge of entertainment, presented by the people who are discovering it today. Backbone's tuner is the first RTSP/RTP based MPEG-4 AAC player for the iPhone. The Student Radio Network provides community within and among the schools, and it enhances their ability to communicate with alumni, the student body and their families. Worcester, MA (PRWEB) February 2, 2009 -- Backbone Networks Corporation today announced its College Radio Tuner application for Apple's iPhone® and iPod Touch® is now available from the iTunes App Store®. This free application showcases the growing IBS Student Radio Network, a collaborative effort between Backbone and the Intercollegiate Broadcasting System. The College Radio Tuner allows a worldwide mobile audience to find and listen to cutting edge, student-run Internet radio stations. It allows the user to scroll easily through a list of stations, find and click to play live internet radio right on the iPhone or iPod touch, whether connected via WiFi, 3G or Edge networks. The College Radio Tuner automatically searches for and adds new stations as they become available. Initial release of the tuner includes a complement of twenty five participating IBS-SRN stations, with more joining every month. Among these initial participating stations are those affiliated with Oklahoma State University, Goucher College, and Methodist University. Stations originate their programs in superior quality MPEG-4 AAC format, the same international standard Apple® uses for its iTunes Store® offerings. 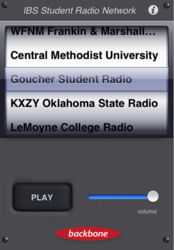 The College Radio Tuner is the first RTSP/RTP/AAC player for the iPhone and iPod Touch, bringing the open standards supported across the rest of the Apple product line, including QuickTime®, to these devices. 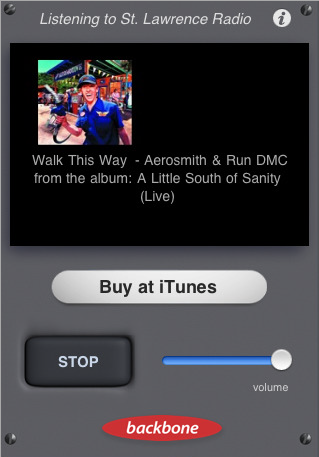 In addition to streaming music and other audio to the iPhone, the College Radio Tuner also displays album or station image art, as well as embedded text listing artist, song title, album name, and other information The tuner also provides clickable links to the station's web site, to the iTunes Store, where listeners can purchase and download the playing song, or to a call-in phone number that the iPhone automatically dials to facilitate listener interaction and talk radio segments. Station-controlled automation software is supplied by Backbone, who provides central networked hosting for all IBS-SRN member stations. Stations can broadcast both live and automated radio program material, including remote live coverage of school sporting events and concerts. Backbone CTO George Capalbo added, "The Student Radio Network provides community within and among the schools, and it enhances their ability to communicate with alumni, the student body and their families." In contrast to commercial radio, IBS Student Radio Network stations are typically run by students rather than professional staff. Programs are a result of both school curricula and student club activities, and include events that involve their schools, communities and the development of the arts. Last fall, the IBS-SRN held IBS Palooza, the Internet's first multi-venue music festival where participating schools independently showcased local independent musicians and bands, broadcasting simultaneously over a weekend long concert. Schools shared live feeds among stations on the IBS Student Radio Network. A spring IBS Palooza is scheduled for April 2009, and will be available free on the College Radio Tuner. In 2007, Backbone Networks Corporation, in cooperation with the Intercollegiate Broadcasting System (IBS), launched the first true Internet radio network, one that specifically aims to enhance the student radio experience. The IBS Student Radio Network enables student operated stations to syndicate live and produced programming among member stations, as well as automatically access a vast amount of royalty-free programming from worldwide third-party sources. This formative network is establishing cooperative relationships with content providers to bring its member stations vast collections of news feeds, royalty-free music from emerging and alternative independent artists, and other programming. Member stations are able to draw programming from one another through shared server databases, as well as have access to each other's live feeds, including remote sporting events and concerts. Select IBS-SRN stations are available on iTunes radio College Radio genre. The Intercollegiate Broadcasting System (IBS) is a nonprofit association of mostly student-staffed radio stations based at schools and colleges across the country. Over 1,000 IBS member stations operate all types of facilities including Internet - Webcasting, closed-circuit, AM carrier-current, cable radio, FCC-licensed FM, LPFM and AM stations. Backbone Networks Corporation helps organizations create their own professional quality Internet radio stations. Using Backbone's advanced Internet radio automation software for the Macintosh® and Backbone-hosted central server software, the Company offers the only server-based content sharing network for Internet radio stations. Backbone was founded in 1990, and its founders have been active in the broadcast and communications industries for decades.